From the desk of my publisher, Central Avenue Publishing, comes the new release of "How To Be Happy - Not A Self Help Book, Seriously" by internationally acclaimed poet and writer Iain S. Thomas. Thomas, whose critcally acclaimed "I Wrote This For You" has wowed readers the world over, has produced a collection of musings and thoughts that are profound, life affirming and - potentially - happiness inducing. 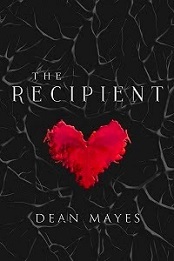 Central Avenue Publishing is proud to publish another book by the widely acclaimed poet Iain S. Thomas. As many have noted on various social media platforms, there have been some issues that have led to the delayed release of this book. For this, we apologise and hopefully the content of the book will clarify the circumstances surrounding this delay. 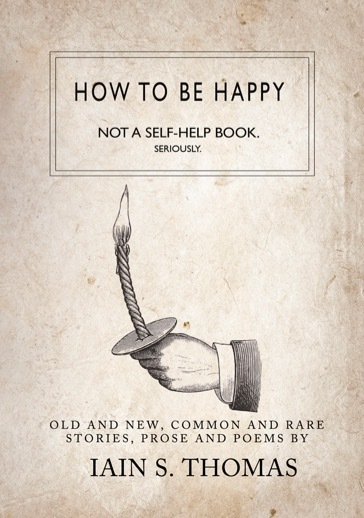 We feel we should also point out that this is not technically a self-help book, but it does contain some poignant prose, poetry and stories which may or may not lead you to happiness. 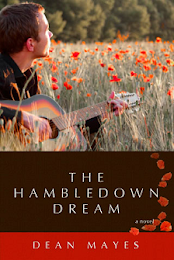 Mostly, it is the rather unfortunate chronicle of a man's attempt to write the book he's promised his publisher, no matter the cost to his sanity. How To Be Happy is available now in print and digital formats. Visit Iain S. Thomas here. Purchase How To Be Happy here. 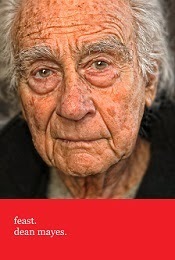 The Wars That Saves Lives - A Look At My Saga. By now, I'm sure most of you would be aware that it is shaping up to be huge year for Star Wars fandom. We've just seen the conclusion to season 1 of the animated series Star Wars: Rebels and we're about to embark on season 2 in the American fall. 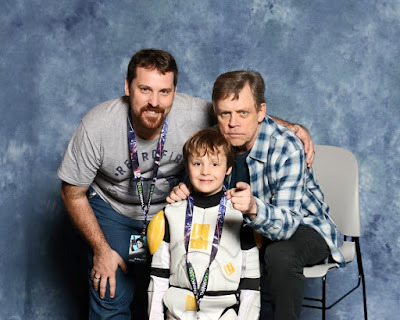 We've seen the hugely successful 4 day convention extravaganza Star Wars Celebration in California and a big Star Wars presence at the recent San Diego Comic Con. And, unless you've been living under a rock, you will know that come December, Star Wars will return to the big screen in the highly anticipated first entry in the sequel trilogy The Force Awakens. For a franchise that was considered to be done and dusted just 10 years ago after the final film in the prequel series, it is quite a momentous change in fortunes for George Lucas' genre defining franchise. Now, those of you who know me really well, know that I'm a massive Star Wars fan and, for me, it feels like there has been no better time to be a Star Wars fan. In the past year alone, I've been able connect with a number of like fans around the world and I've loved being able to rap over something that is so mutually loved. Central among these new connections, has been an Australian documentary film maker named Adam Harris. Adam came onto my radar last year when he launched a Kickstarter campaign titled "My Saga" in which he sought backing for a documentary film project. The project description immediately caught my eye. 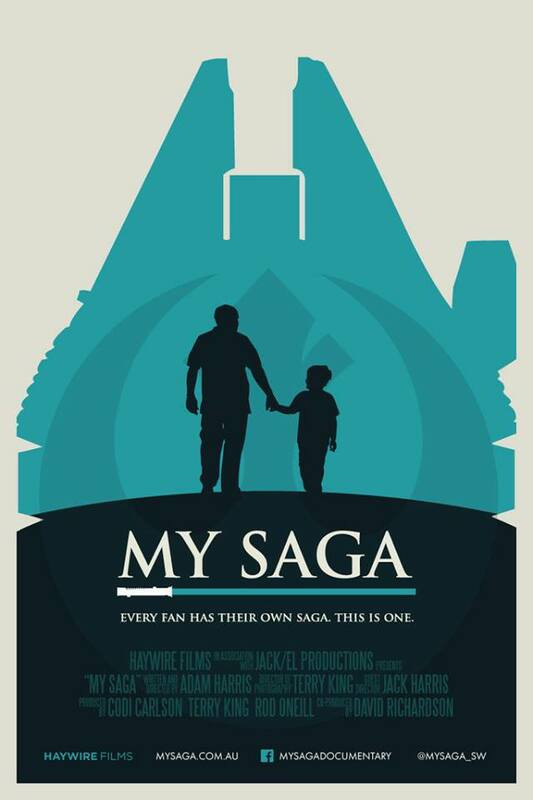 "My Saga - A Star Wars Documentary is a story that will show for one person that Star Wars not only changed their life...it saved it." The initial campaign was wildly successful and the production has since gone from strength to strength as Adam as his small team of film makers work tirelessly to bring the documentary to fruition. And indeed we will see it with the announcement, earlier this year, that Adam Harris' film will be released internationally in 2016. 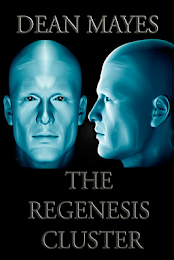 "My Saga follows the journey of Adam Harris, a husband, father and Star Wars fan. Four years ago, the discovery of a brain tumour and a serious health scare caused Adam to re-evaluate his priorities and follow his dreams. 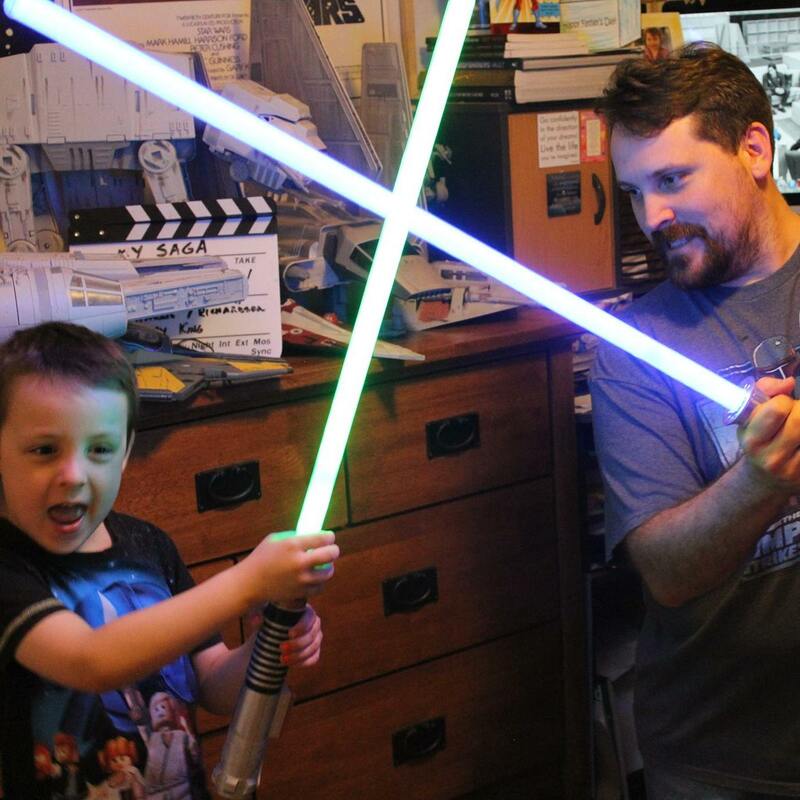 Star Wars has always been a constant source of joy, comfort and even safety in Adam’s life. When it became apparent his children shared the same deep love and affection for Star Wars, Adam felt compelled to discover just what it is about Star Wars that creates such devoted fans that span across multiple generations, all around the world. With his son Jack by his side, Adam has spoken with fans, enthusiasts, die-hards as well as cast and crew members from the films. 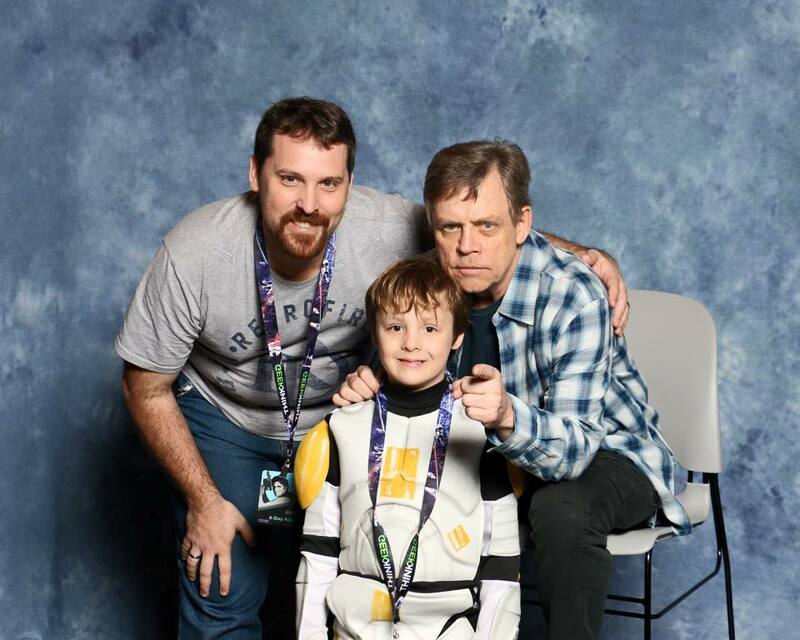 All the while discovering what Star Wars means to him, and the impact it’s had on making him the husband and father he is today. Every fan has their own saga. This is one." The first teaser trailer for the film took the internet by storm when it was released onto YouTube and Adam has increasingly captured the attention of media outlets both here in Australia and overseas. Adam was featured in a number of interviews by official media covering the recent Star Wars: Celebration in California and he has received support from major Star Wars identities. In the whirlwind procession of Star Wars and Star Wars related media that will be coming our way over the next 12 months, My Saga promises to be a lovingly constructed journey of one man's Star Wars fandom and will be on my own personal list of must see films in 2016. Connect with Adam Harris here. Connect with My Saga here. Tweet with My Saga here. Talking The Recipient On ABC Radio. 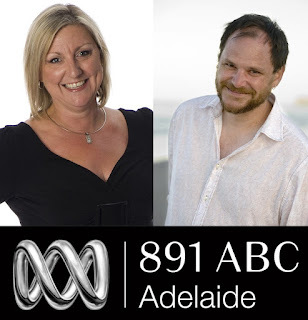 Today, I sat down with ABC Adelaide's Sonia Feldhoff on her 'Afternoons' program to discuss my dual career as a writer and Intensive Care Nurse. 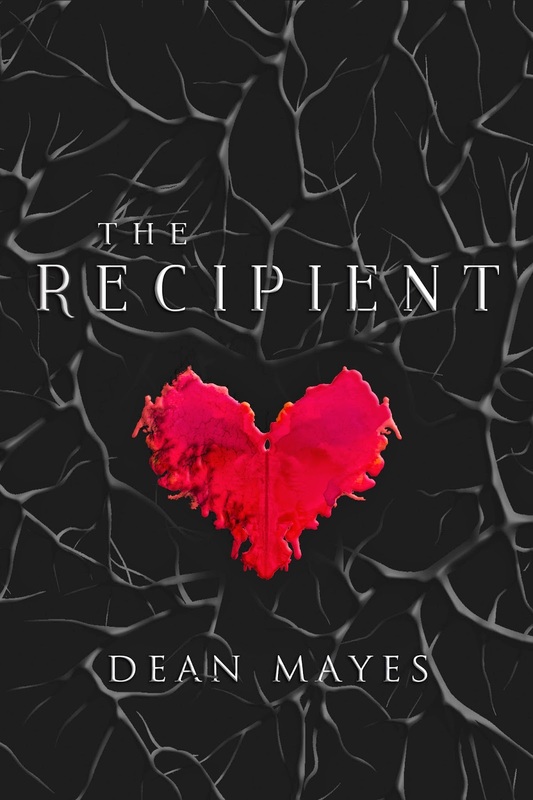 We explored how I juggle those two careers and we touched on the inspirations behind my forthcoming novel "The Recipient". I have recorded the audio and am pleased to present the interview here as a downloadable mp3. The interview runs a just shy of 8 minutes and it was a lot of fun to do. Click on the image below (featuring me and Sonia) and enjoy. (Click the above image to download the mp3 from Dropbox - No account required). Knuckle Dragger by Scott Taylor. There are facets of life that have to be seen to be believed. In the absence of personal experience, there are those who can document and retell them with hilarity, fearlessness and, at times, great affection. 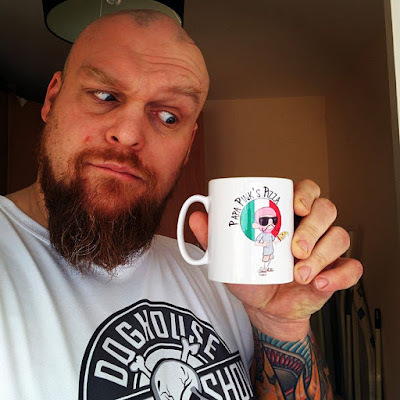 Knuckle Dragger - by Aberdonian author and podcaster Scott Taylor is a project that he has slaved over for more years than he would care to admit. 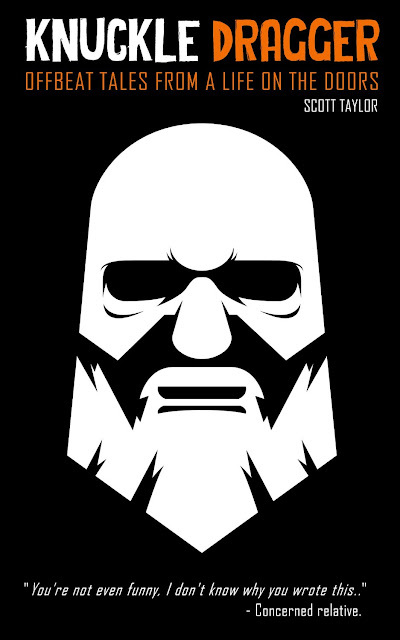 Having watched the project grow, stall and start again through periods of distraction and self doubt, I can empathize with just how challenging it has been for Taylor to bring Knuckle Dragger to fruition. That it is now in the public realm is certainly a significant achievement for him - if only for the fact that so many people were pushing him to get it out there. What would you do if you caught your man-sausage in your zipper at work, then had to race to the hospital where a sleep deprived, homeless looking doctor tried putting it back together with what looks like fishing trawler rope? Or what about having someone try to ram a full twelve inch, burning hot pizza up your nose while you’re driving a car at speed? Maybe you too have suffered an unsolicited winky appearing into your toilet stall while you go ‘boom boom’, and then had to batter it away with the nearest heavy blunt instrument you could find. Or perhaps you've watched a bored Highlander tear apart a designer sofa with a chainsaw in the middle of an executive charity ball evening? If not, then this collection of tales from over 23 years of working as a club and bar bouncer could tickle your proverbial fancy. Join Scott Taylor as he shines a light on the funnier side of the late night industry and his life around it, and brings you a collection of stories that are sure to either bring a smile to your miserable face, or at the very least bring back up your cheap supermarket lunch all over your stupid designer skinny fit t-shirt. Of course, the book itself is a significant achievement on its own terms. In Knuckle Dragger, Scott Taylor distills 20 odd years of a life spent 'on the doors' in Scotland's urban jungle into a bitingly funny and sharply observant account that will have your jaw on the floor, your sphincters tensing uncomfortably and your accessory muscles rupturing - and quite possibly bleeding. I had the rare privilege of reading several early drafts of Taylor's work and there was comedic brilliance in it from the get go. He has stuck to his guns and refined the narrative into something special. It is at once, slick and polished but it is an inviting read - if you are one for whom little shocks you. There's a warmth and affection in the way Taylor portrays certain characters, while others for whom he has less affection for, he lavishes with an even greater spread of comedic take down. Taylor's approach in recounting these grand, salubrious and often shocking tales is full of enthusiasm and wit but it is his tome that elevates Knuckle Dragger above the level of the front bar stories told over generous pints. Imagine, if you will, the love child of Noel Coward and Randall "Tex" Cobb combined with the verbose tones of a Frank Thring. Knuckle Dragger has a particular kind of poetry in it's observations of the night time world. Scott Taylor is the host of the globally popular DHB Radio Show and a 20 year veteran in the security industry. Listen to the DHB Radio Show here. The city of Adelaide was thrust into a collective shock over the weekend, following the murder of AFL Adelaide Crows coach Phil Walsh, by his own son. Acres of page space and swathes of internet bandwidth has been taken up with the reporting of this tragic event so, for the sake of brevity, I won't reproduce the story in full here. A quick Google Search will yield all you need to know about the event and the circumstances of the murder. image credit; Australian Football League. In the collective grief that has followed, I have conversed with many people who are trying to come to grips with this heinous act. Clearly it is one in which many can't - and justifiably so. Here we have a son, coming home in the early hours of a Friday morning and, following a domestic dispute, has fatally knifed his own father. It is an unforgivable act. One which he will be tried and judged for. The ramifications are incomprehensible. A loving father, husband and family man has been taken from this earth and his family has, in one fell swoop, been utterly destroyed. In the immediate aftermath, through the white noise of incessant media analysis, I myself tried to get my head around it. I happened across one newspaper article which was moving and prescient. Penned by Herald Sun columnist Mark Robinson in April 2015, that very journalist embedded himself with Phil Walsh for a period of time and produced a insightful piece on the AFL Coach - both the professional man and the private man. image credit: News Limited / Sarah Reed. 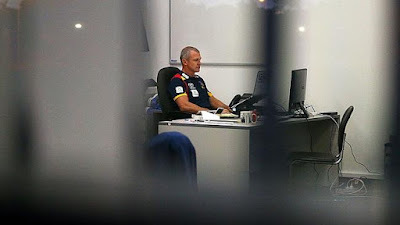 In it, Phil Walsh is cast as a committed football coach, brilliant tactician, father figure to many young footballers and widely respected as an astute football mind. Walsh also reflects on himself as a family man and father and he admitted that all was not well between himself and his son. I should clarify here that nothing - Nothing - can excuse the behavior and the actions of Cy Walsh, nor can Phil Walsh be blamed in any degree for those actions. What does become clear is that the demands of his job and his obsession with it drove a wedge between father and son that was damaging. "...But have I been a good father? To my son, I had a disconnect because of footy. “I just immersed myself, got consumed and was selfish with as much time I committed to footy. I’m basically talking about my 10 years at Port Adelaide, just the desperation to win a premiership and I thought it was all about me, when it’s all about the players. “I lost that connection and I’m trying to reconnect with my son, which I have done." 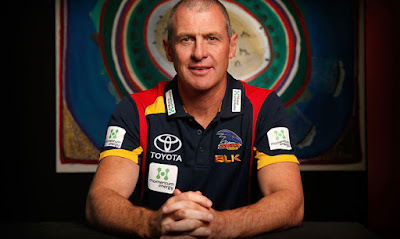 - Phil Walsh, April 2015. On Sunday morning, I was at my own son's local footy game and I fell into a conversation with one of the other dads. Inevitably the talk turned to the events of Friday and the shocking aftermath. Terms like utterly shocking, pointless, a waste came up. And then he asked the question, "What can be taken from this?" I have indeed asked myself this very same question. My eyes were inevitably drawn to my own son, out on the field. Reflecting on my own relationship with him, there have been plenty of times where I have placed other priorities ahead of that relationship - be it work commitments, writing commitments or any one of a number of other things. One can argue the merits of degrees of neglect in this but I do know that I have disappointed him and I have disappointed myself. 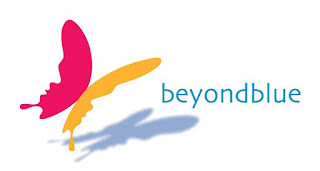 For advice and support, visit Beyond Blue (click above).